The first automated cell counter with built-in printer! 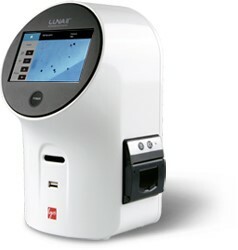 The LUNA-II™ automated cell counter has integrated a novel focusing mechanism based on liquid lens technology. The liquid lens does not use any mechanical moving parts to change the Z stage. Instead, the Z position of the sample is rapidly obtained by the application of a small voltage to the liquid lens. The elimination of moving parts removes noise and significantly reduces the need for servicing. Even after multi-million cycles of focusing, the liquid lens does not require repair or service. In combination with this novel focusing mechanism, the LUNA-II™ has integrated a new autofocusing algorithm optimized for cell counting. Built-in printer option available for convenient record keeping. Now with 2 choices of slides! COST EFFICIENT: The new LUNA™ Reusable Slide has been designed to work with the LUNA™ family of cell counters for cost-efficient and accurate cell counting. The LUNA™ Reusabl Slide has the affordability of manual cell counting without the associated subjectivity and time. Contact us today for a free demo opportunity.